Our Lodge, Santa Adela, is conveniently located just a couple hours drive from Buenos Aries. No hassling with Domestic flights and delays. Once you arrive at the International Airport our driver is there to take you the short 2-3 hour drive to the lodge. Most of our guests get a half day of hunting on both the day of arrival and day of departure. The Pampas suffered from heavy flooding back in the 1980's which turned this area into a Duck Hunters paradise. Rich Argentina Farmland is pocketed with wetlands, ponds and potholes. Our hunters enjoy world class secluded Duck Hunting. You couldn't design a better duch habitat than the Pampas. We have both guns and ammunition available for you at the lodge however some of our guests like to bring their own firearms. For rules and regulations go to here. We pamper our guests with all the amenities of home, plus a few I'm certain you don't have. Hunters are always accompanied by a professional guide who will cater to your every need. We generally shoot over ponds and creeks, mostly over decoys but we also have some passing shooting. Blinds are set on solid ground so hunters avoid the hassles to be in the water during the cold early hours of the winter. We count with the best modern American hunting equipment like decoys, robo-ducks, portable blinds, special stools and so on. Most of our duck hunting blinds are just minutes away from Santa Adela, which means you can easily return to the lodge for an afternoon rest, delicious meal, or just to hang out and enjoy the atmosphere of the lodge. Although the national language is Spanish the majority of our staff is bilingual. You will not have any problem communicating with us during your stay. Along with world class duck hunting Argentina also has some of the best beef in the world along with award winning wines, all of which we serve daily at the lodge. Along with 13 species of Ducks, the Pampas also has a tremendous population of Doves, Pigeons and Perdiz. 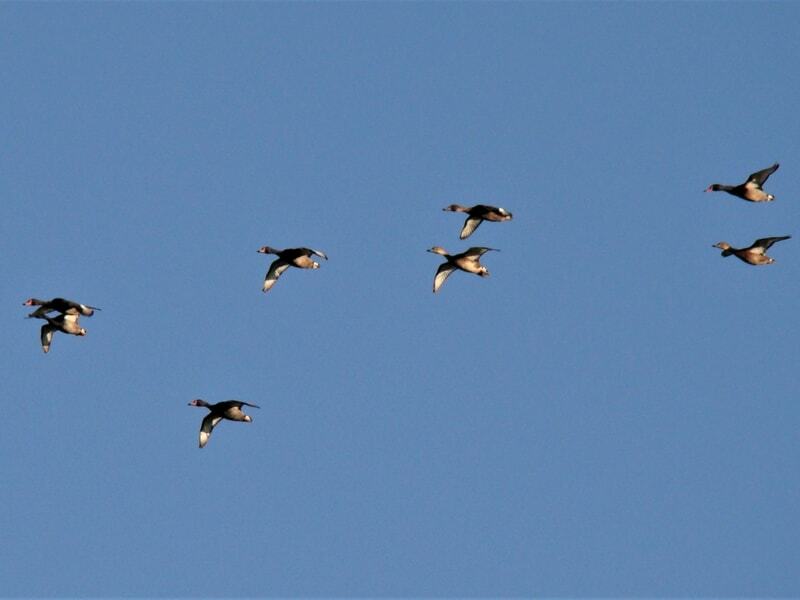 This offers our hunters some of the best Mixed Bag Hunting anywhere. 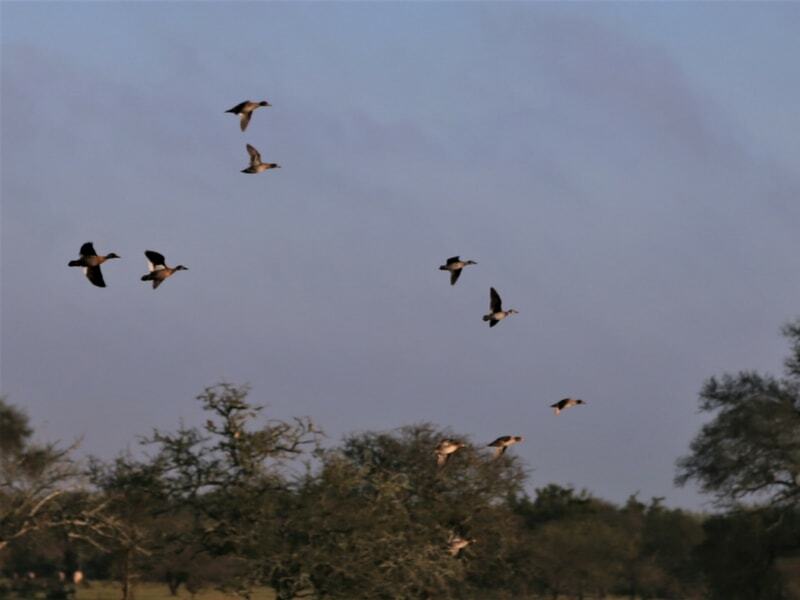 You can hunt Ducks in the morning from a blind and then go walk the fields with our hunting dogs for Perdiz in the afternoons. Depending on the time of year and season you can mix and match your hunting experience in many different ways. The overall body plan of ducks is elongated and broad; they are also relatively long-necked, albeit not as long-necked as the geese and swans. The body shape of diving ducks varies somewhat from this in being more rounded. The bill is usually broad and contains serrated lamellae, which are particularly well defined in the filter-feeding species. In the case of some fishing species the bill is long and strongly serrated. The scaled legs are strong and well developed, and generally set far back on the body, more so in the highly aquatic species. The wings are very strong and are generally short and pointed, and the flight of ducks requires fast continuous strokes, requiring in turn strong wing muscles. Ducks exploit a variety of food sources such as grasses, aquatic plants, fish, insects, small amphibians, worms, and small mollusks but crop grains (corn, rice and so on) is what they prefer to eat in Argentina. As for breeding, ducks are generally monogamous, although these bonds generally last only a single year. Larger species and the more sedentary species (like fast river specialists) tend to have pair-bonds that last numerous years. Most duck species breed once a year, choosing to do so in favorable conditions (spring/summer or wet seasons). Ducks also tend to make a nest before breeding, and after hatching to lead their ducklings to water. Mother ducks are very caring and protective of their young, but may abandon some of their ducklings if they are physically stuck in an area they cannot get out of (including nesting in an enclosed courtyard) or are not prospering due to genetic defects or sickness brought about by hypothermia, starvation, or disease. Ducklings can also be orphaned by inconsistent late hatching where a few eggs hatch after the mother has abandoned the nest and led her ducklings to water. Santa Adela is a full service lodge that will exceed your expectations. Only catering to a small number of people each week you can be assured of excellent service and attention. Along with private guest rooms we also have a very comfortable living area, chef quality kitchen, grand dining area and much more. Day 1: Depart the U.S. to Buenos Aires. Day 3 - 5: Morning and afternoon duck hunts are scheduled. You can also request to hunt perdiz, dove and pigeon or big game during the afternoon. All meals are provided. Day 6: After morning of Argentina duck hunting and lunch, you will be taken back to Buenos Aires for your flight to US. Day 7: Arrive back in the U.S. 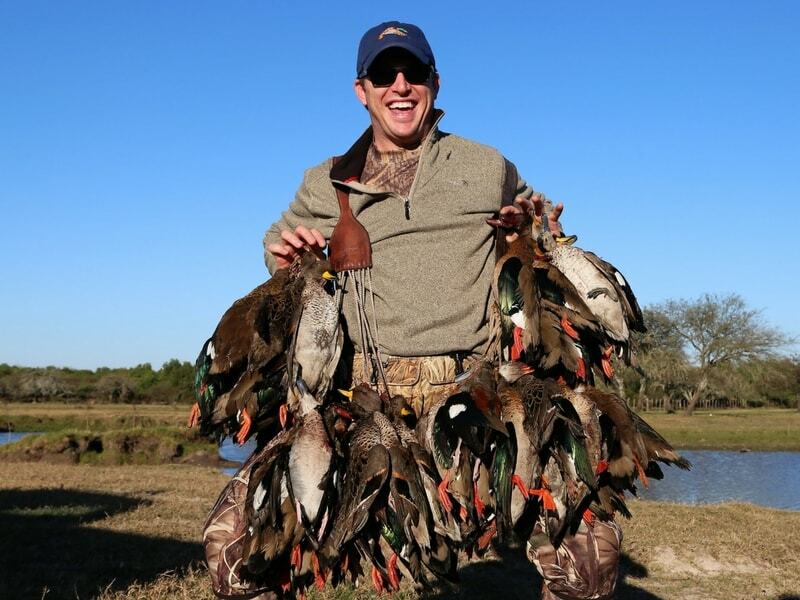 This is just an example schedule of an Argentina Duck Hunting Trip with Argentina Big Hunting.We want to make your trip as special as possible so please let us know how we can adjust theschedule to meet your expectations.